Google Maps looks a little bit more like Foursquare this week with new "check-in" and "rate and review" buttons on Place pages. 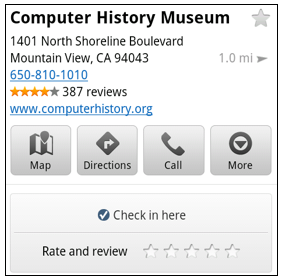 The new buttons feature prominently on each locale's page and make it easy to check in and give a star rating with just two taps. The upgrade comes to Google Maps 5.5 for Android along with some tweaks and more integration for its Latitude service, the company's official social location-based service aimed at Foursquare fans. Each time a user checks in via Google Maps, they're given the options to share the info with their friends on Latitude and/or post it publicly, which shares your location "via Google Profile and the Web." The number of Latitude users is well below the 200 million people who use Google Maps worldwide via mobile devices, which makes me wonder if this might be the beginning of merging its social features directly into Maps. For those who are using Latitude and have grown a bit obsessive about tracking their own comings and goings, particularly with the Location History dashboard, it's also now easier to change your home and work location within Latitude. Also new this week are redesigned transit station pages in Google Maps. Each station page now has a list of upcoming departure times, all the different lines serving the particular station and links to nearby transit stations. Google's transit initiative has been steadily expanding and now encompasses an impressive 446 cities worldwide, meaning it's just as easy to pull down bus and train schedules for Grand Junction, Colo., Norman, Okla., and Halifax, Nova Scotia as it is for the Bay Area or the entire state of New Jersey.